As part of a broader programme of sustainability initiatives addressing the challenges of climate change, BAA had decided to initiate a site-wide car sharing scheme across all the airports under their management. The work David Hughes and his team produced to promote the BAA Carshare scheme won recognition from the Association of Commuter Transport as a benchmark example of how to market a car share programme. By the time BAA’s programme was awarded the top prize in an annual ACT round-up of best practice it was already regarded as the most successful scheme of its type in Europe and registrations were well ahead of target. The work started with an identifying mark that encapsulated the idea of sharing. The key device has been used to brand the scheme in a variety of media from key fobs to reserved car parking spaces. 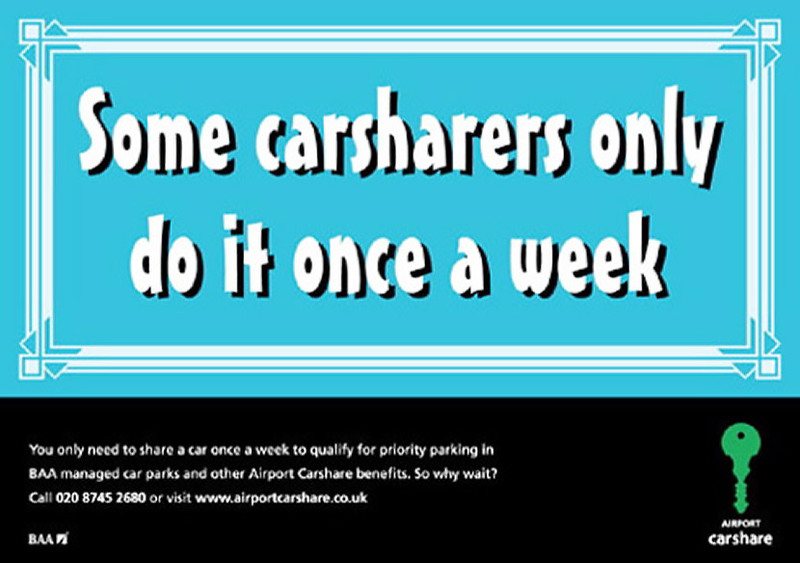 A series of 48 sheet posters in staff car parks launched the campaign. DL leaflets extending the sharing theme were available as take-one’s and mailed out to employees and the wider airport community. A2 and A3 posters reinforced the message in staff areas around the airports and alongside ads in ‘house’ magazines, helped to tackle common misconceptions. This poster, for example, using a pastiche of typical car bumper-sticker humour, helped make a serious point about participation. Early success could be measured by the increasing number of empty parking spaces and by the number of registrations which, by the end of our involvement, numbered more than 2,ooo. The creative team led by David Hughes included Piers Rutterford as senior designer and Mike Reed as the lead writer on the project. But the success of the campaign included contributions from many others too, not least a wonderful client team headed by Heather McInroy. Steve Wakeham was responsible for the photography.